The Bluelab Grower’s Toolbox combines the essential tools you need to easily manage your crop by measuring the pH, conductivity (ppm) and temperature of the nutrient solution. Learn the hydroponics basics with the Grow Book, so you can get going… And keep growing with the ultimate handy team, the Bluelab pH Pen and Bluelab ppm Pen. These clever little pens make it easy to measure the nutrient uptake (pH), the amount of food available (ppm) and the solution temperature, so you can create the best nutrient environment for your plants’ growth. 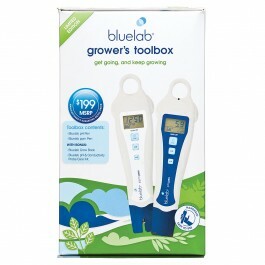 The Bluelab Probe Care Kit makes maintenance easy to maximize the life and accuracy of the pens probes. With these tools and essentials in one value added pack, The Grower’s Toolbox is a complete simple crop management system that helps you get it right, from the start.